William Henry Crapp, was 25 in 1890. Both the Crapp brothers, William & Henry/Harry, had the nickname "Ivo." There is some confusion with the entry for W. Crapp, perhaps there were two players with this W initial. Carlton played Melbourne in round one of the season on the M.C.G. Crapp was named in the 20 and was mentioned among the new players, he was recruited from the Star of Carlton club. 1889 at the Carlton AGM on Friday April 6, William H. Crapp received an illuminated address along with W. Strickland and Tommy Leydin. 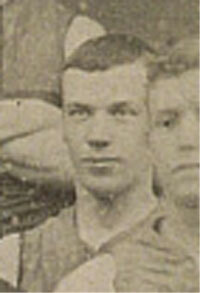 In Season 1893, two brothers with the surname of Crapp joined Carlton in the VFA. One brother had the initial of W (pictured above), whilst we do not have the initial for the second brother. Although not confirmed, it is highly likely that these brothers were related to Henry 'Ivo' Crapp, a Carlton player between 1885 and 1889 and later a leading Umpire of both the VFL and the WAFL. 1893 Brothers, W. Crapp and Henry 'Ivo' Crapp were recruited from the Carlton Juniors in the V.J.F.A. The Crapp brothers made their senior debuts for Carlton in the opening round of the 1893 season against North Melbourne. 1893 The Crapps were named in all six team squads for the first six rounds of the season, then only one was named for the next two rounds, ending round 8 July 1. Their names then, do not reappear in 1893. Ivo Crapp (a former Carlton full back and brother of the famous umpire) was a pallbearer at the funeral of Harry Goding a former South Melbourne player and official. "More than 100 old players and officials attended the reunion at Carlton on Saturday. Five former captains were among them - "Pompey" Elliott, Jack Wells, Ray Brew, Paddy O'Brien, and Horry Clover. The oldest was Fitzgerald, who was in the 1887 team, W. H. Crapp, and the orginal "Dookie" McKenzie (of the late 80's) were others. Mr. D.H. Crone, former president, was among those welcomed by Mr. Ken Luke, president." The Argus reported the death, on Dec 22, of William Henry (Ivo) Crapp the "most famous of all League football umpires". As Henry (Ivo) Crapp ("the prince of umpires") died in Perth in 1924, this is most likely a reporting error, and actually be the death of Ivo's brother and former Blue, W. H. Crapp. Crapp - On December 22 at private hospital, Melbourne. William Henry (Ivo) Crapp, loved son of of the late William and Emma Crapp, brother of Thomas, James, Henry, Louisa (all deceased), and Edwin. Maybe the brothers both had the nickname of "Ivo"? Page last modified on Sunday 01 of October, 2017 12:16:07 AEDT by blueycarlton. 1979 Rd 3 - Mark Maclure takes a strong chest mark. 1996 - State Capt. Silvagni, Coach Rod Austin & the Cup.